I didn’t practice much this weekend, too busy Saturday, too lazy Sunday, and home sick with vertigo on Monday. Still, I put in at least a few minutes every day and managed about 40 minutes tonight. When I started this, I thought I would be able to practice an hour or more every day, but my back isn’t cooperating. Still, I’m making progress, just not as fast as I’d like. To help me keep things moving and keep from practicing only the ones I am most comfortable with, I’ve made some practice sheets. 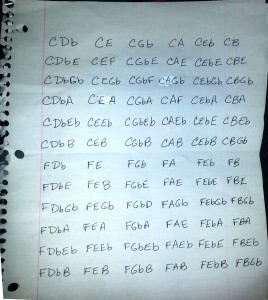 This is the second major chord page. When I start a new page, I practice each sequence six to ten times before moving on to the next. By now, I’m able to do this entire page with almost no error. 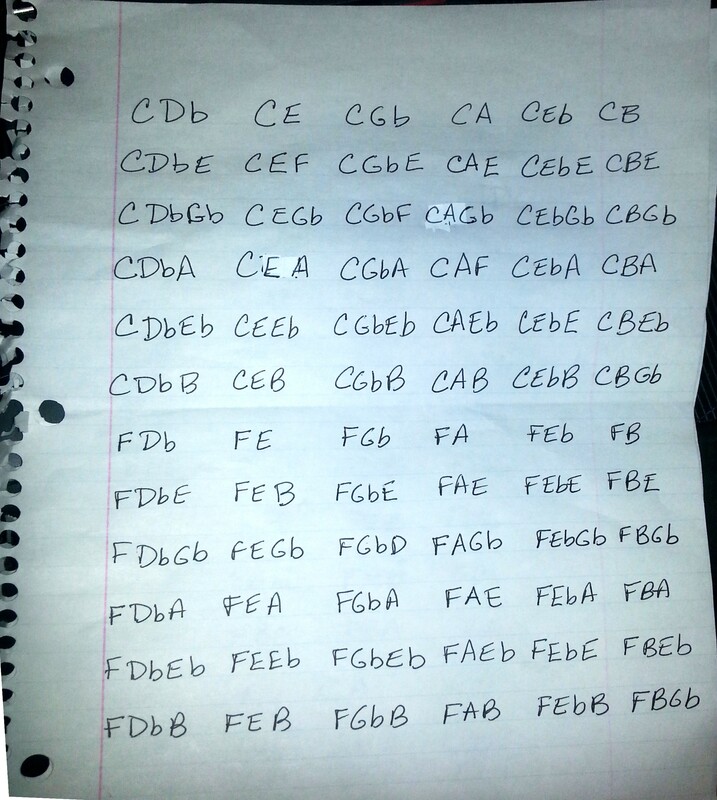 I’m ready to add a final sheet with the rest of the major chords and then it’s on to the minor chords. I have also been playing a few songs from my Disney songbook, just to check to see if the chord practice is helping. Even though I am running across chords I haven’t been practicing, I am finding it easier and easier to play. Because I’m stronger in the major chords, it’s easier for me to quickly figure out the minor chords and keep going. I’m beginning to think that by the time I’m done with the 20 hours, I’m definitely going to feel like this has been a success. I just need to keep practicing. As I mentioned the other day, I am starting on a new adventure of learning and change. Eventually, I hope to add 6 skills this year, but for now I’m concentrating on the piano. It’s true that I can play the melody of most simple songs, especially if they’re not too fast. It’s also true that I can play a C, D, F and G chords without trouble and can manage a couple of minor chords at a slow enough pace. However, that doesn’t give me a wide enough range or enough flexibility to play even a song as simple as Jingle Bells as easily as I’d like. I don’t have lofty goals here, I just want to be able to play Christmas carols and my favorite Sherman brothers songs without fumbling. 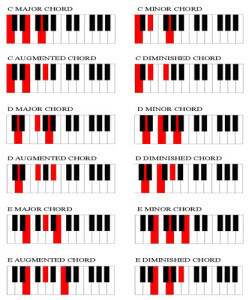 I started two nights ago by reviewing all of the major chords. As expected, I’m good with C, D, F and G, but that’s about it. I spent about 40 minutes on the entire range of major chords and didn’t feel like I had made any progress. Last night, I simplified things and worked on A, B, C, D, E, F, G and left Db, Eb, Gb, and Bb for tonight. That went a lot better, and I already feel like I’m improving. This is fun so far, but a bit of a challenge. I am using a timer to make sure I practice at least 45 minutes each night. Without it, I might only do about 15 minutes at a time. Maybe as I get better, the time won’t drag quite so much. I hope. I picked up this book after hearing about it on a podcast. The author, Josh Kaufman, preaches that you can learn anything in 20 hours or less. You won’t be an expert, but you’ll get past the steep part of the learning curve and be good enough. Well, good enough is good enough for me, so I’m going to give it a try. I have a list of more than 25 skills I want to acquire, and that’s just off the top of my head. I’m sure I could triple that list without even trying. That’s a lot of things to learn, even at only 20 hours each, so what to do? Piano – learn to play all major and minor chords and be able to sight read the treble clef so that I can play any song out of a Fake book. German – learn at least 200 vocabulary words and be able to ask and answer simple questions like “How are you?” “Where are you going?” “Where are you from?” etc. Guitar – learn to play the most popular chords and strum on the beat. Painting – learn multiple wash techniques, brush strokes and fine detail. Writing – focus on plotting techniques, outlining and description. I am starting with piano because I’m already halfway there, and I want to be able to play Christmas carols for the family this year. Also, I thought it would be an easy win to propel me forward. Drawing, on the other hand, is something I’m really not good at, so it’ll be a much bigger challenge. The same is true for guitar, since I’ve never even tried to play one, even though I’ve owned mine for at least 18 months. I just find it really intimidating. I will try to keep you informed about my progress. It may mean a little less time for my crafting, but it will be worth it as I learn a wider branch of skills. Wish me luck, and think about giving it a try. It can’t hurt, right?